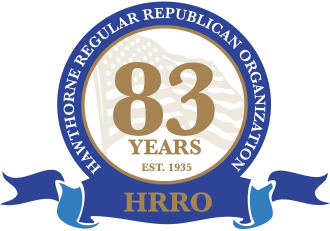 Eighty three years ago, the Hawthorne Unit of the Passaic County Republican League was formed by 36 interested and dedicated people under the leadership of Raymond L. Rhodes. Its birth was likened to a pebble that was cast into a pool of water and made ripples from far and wide. The Unit was founded on firm principals, a strong belief in God and government, keen interest in all civic projects and a sincere desire to do all in its power to promote the cause of Hawthorne and to help elect qualified people to office on all levels. Yes, just a small branch of the Grand Old Party, but, as the small pebble cast into the water made ripples far and wide, so did the Hawthorne Unit make ripples and even waves into the political world. Throughout the 83 years, “The Unit” has held to these principles and has continued to grow in spite of the many obstacles which have been thrown in its way. It has been successful in many campaigns and has also known the taste of defeat, but in victory or defeat, the Unit has always been able to hold its head high and bring honor and respect to its self and to the Borough of Hawthorne. Those of us in the Unit credit its success not only to those far sighted people who originated the Unit and established these high principals but also to you, the membership, that has made the Unit what it is today. We look forward to the coming years with hope and confidence. Its members know there will be many changes, but one thing will not change is the principles of the Hawthorne Unit. New bright and eager faces will be added, and along with them will come new ideas. The ripples caused by that pebble which was cast into the water, will continue to grow and the Hawthorne Unit will go on to greater heights than ever before.